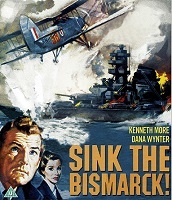 Now on Blu-ray is one of the classic British war films of the postwar period, director Lewis Gilbert’s Sink the Bismarck!, a tightly-plotted fictionalised account of the Royal Navy’s campaign to track down and sink the titular German battleship as it leaves the Baltic and attempts to reach the North Atlantic to spread terror amongst Allied convoys. The campaign examined in almost documentary-like detail in this account switching between the Royal Navy control centre and the various ships involved on both sides, the film opens with archive footage of Bismarck being launched in 1939 then switches to narrative mode as Captain Jonathan Shepard (Kenneth More, no stranger to war films or the sea having starred in both Reach for the Sky and A Night to Remember) arrives at the underground control centre beneath the Admiralty building in central London in May of 1941. Intelligence has reached the Allies that Bismarck is passing Norway on its maiden voyage to start operations against Allied convoys in the North Atlantic. Due to its great size and firepower (and Nazi propaganda) the Bismarck is considered an almost unstoppable superweapon and Shepard is tasked with intercepting and destroying it at any cost. This involves deploying substantial numbers of warships pulled from the Navy’s Atlantic and Mediterranean fleets, and subsequent engagements with Bismarck and its accompanying cruiser Prinz Eugen would see the loss of many of those vessels including the mighty HMS Hood though ultimately the Royal Navy prevailed and Bismarck was crippled and then scuttled on the morning of Tuesday 27th May. Shepard is a fictional character created to provide a narrative focus in the operations centre: upon arrival and assuming command it is made clear that he is a repressed, by-the-book man who expects a certain degree of military formality and professionalism, something the other ranks have become unused to. While it would have been easy to depict him as some kind of martinet, More resists the temptation. His star persona at this time was that of a jolly decent chap who exemplified a certain type of English upbeat fortitude and it would have been unusual to see More playing such an intense, almost tortured character. He is surrounded by numerous British character actors playing the various naval officers and ratings including Esmond Knight who had served in the Royal Navy and had taken part in the campaign against the Bismarck, and unlike many films of the era the German forces are given equal screentime and never depicted as other than as committed as their opponents. Lewis Gilbert was one of the great journeyman directors of British cinema who began his career as an actor in the 1930s and moved into direction after the Second World War. By the time he made Sink the Bismarck! in 1959 he already had several significant features under his belt including various inspirational wartime stories such as Carve Her Name With Pride and Reach for the Sky. An extremely competent and unflashy director, Gilbert could turn his hand to any genre on the widest variety of scales. Later in the sixties he directed Michael Caine in Alfie, arguably his biggest hit. He also turned his hand to three different Bond films including the most extravagant of them all, The Spy Who Loved Me, in 1977. His later career was spent on a much smaller scale adapting stage hits such as Educating Rita and Shirley Valentine. An entertaining if somewhat dry account of one of the great naval operations of the Second World War adapted from by C S Forester’s novel The Last Nine Days of the Bismarck, Sink the Bismarck! is helped by employing one of the most engaging plots in cinema: the plucky group fighting against the odds to take down a superweapon before it can be gainfully deployed, a narrative with which George Lucas is somewhat familiar with. Gilbert balances the intimate and the grand scales with great skill assisted by the cream of British character talent and some superb model work which was a cut above what was normally seen at the time. The release comes with both a mono and stereo soundtrack and also includes a new interview with film historian Sheldon Hall who gives a comprehensive account of the film’s production.